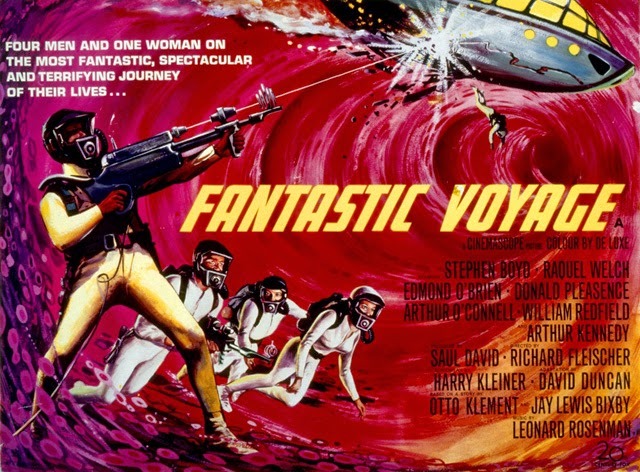 Classic Sci-Fi: FANTASTIC VOYAGE | Warped Factor - Words in the Key of Geek. Matt Donabie is going to see things no one has ever seen before (and we don't mean Raquel Welch in a wet suit).. Most science fiction films, for obvious reasons, are set in the future, as plot lines involving futuristic technology are more credible if they are set in a futuristic setting rather than in a contemporary one. There are a few exceptions to this rule; movies about aliens visiting earth, whether they are here to conquer (War of the Worlds) or offer assitance (The Day the Earth Stood Still), generally have a contemporary setting because in these cases it is the aliens, not the humans, who have developed the advanced technology. In any case, a film about an alien invasion set in the year the movie is released is always going to have more emotional impact than one set in, say, 3015. There are a few sci-fi films, however, which ask not "What would happen if we could develop such-and-such a technology at some future date?" but rather "What would happen if we had already developed such-and-such a technology at the present date". This is normally done for some special reason. One that springs to mind would be Capricorn One, a film that was released in 1978 and tells the story of a manned voyage to Mars taking place during the 1970s. It's time setting was such because the film has less to do with space flight than with a sinister government cover-up. Similarly 1966's Fantastic Voyage, which revolves around a technology that can miniaturise matter by shrinking individual atoms, has a contemporary sixties setting because the plot involves the sort of Cold War theme that was commonplace in thrillers of this era. The film-makers presciently realised that the Cold War would have finished long before human technology could have advanced to anything like the level depicted here. Indeed, the film starts off like a standard spy thriller. Jan Benes, a scientist from an Iron Curtain country, defects to the West, but Soviet agents attempt to assassinate him. (Whilst researching this I discovered he may have been named after a real Jan Benes, an anti-communist writer and dissident who had been imprisoned by the Novotny regime in Czechoslovakia). Benes is left in a coma with a blood clot in his brain. And this is where the sci-fi element comes in. He cannot be saved using normal surgical techniques, the only way to save him is to use the miniaturisation technology - A specially designed submarine, together with its crew of doctors and scientists, is miniaturised and injected into Benes. The team then have one hour to make their way to his brain and remove the clot with a laser. It soon becomes clear, however, that one of the team is a saboteur with instructions to kill Benes. As many have pointed out, including Isaac Asimov who wrote a novelisation based on the screenplay, the story is full of plot holes, but I won't discuss these here, mainly because it's such an entertaining, fantastical movie, and if you are happy to suspend disbelief for the basic premise of the plot then I'm sure, like me, you are happy to maintain that suspension through the flaws in logic and internal consistency in the film. It's not a documentary, after all. The best contribution is probably from Donald Pleasence as one of the doctors on board the submarine, calm and rational yet somehow sinister. Pleasence tended to specialise in playing villains, including a memorable Blofeld in You Only Live Twice, so it should come as no surprise when he turns out to be the saboteur here. Raquel Welch, in one of her earliest starring roles, looks spectacular in her tight-fitting bodysuit, but lacks the charisma she was to bring to some of her later roles. Stephen Boyd and Edmond O'Brien are adequate in their roles, but neither excel. One of the themes explored in Fantastic Voyage is a sense of wonder at the miracle of creation and the complexity of the human body. Arthur Kennedy's character, Dr. Duval, is particularly given to awestruck philosophising about God and the wonders he has been privileged to see. To inspire a similar sense of wonder in the audience required some very advanced (for 1966) special effects, largely through the use of the use of multicoloured lights, to create an imaginative vision of what the human body might look like from the inside to people who had been shrunk down to microscopic size. Like a number of movies from this period, the look of the film seems to reflect the psychedelic movement of the sixties, and it works well, deservedly winning an Oscar for Best Special Effects. The film was directed by Richard Fleischer, a director who worked in many different genres and who was responsible for films of widely differing quality (from 1954's 20,000 Leagues Under The Sea to the 1980 remake of The Jazz Singer, from directing Rex Harrison in Doctor Doolittle to Arnold Schwarzenegger in Conan The Destroyer), however Fantastic Voyage is one of his better films in the science fiction genre. Despite the leaky plot and some dubious acting, it is a highly imaginative look at an unusual theme. The exploration of outer space has been done to death by Hollywood, both before 1966 and even more after that date. So kudos to all involved for (largely successfully) tackling the exploration of what Dr. Duval calls "inner space".